The people. The people. The results of every staff engagement survey rank The People as the number one reason they love working here. Principal Software Engineer Red Mati and his family arrived in Christchurch, New Zealand from Singapore in 2011. “I was lucky enough to get a job with Pegasus Health as a Senior Software Developer working on a new online system called ERMS (Electronic Request and Management System),” says Red. The project was designed to speed up health service referrals and move them from a paper-based process to an electronic form. When Red started at Pegasus, the organisation had just started using a new methodology for software development, called Scrum. 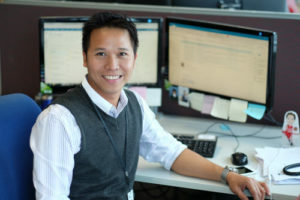 In 2015, Red was promoted to Principal Software Engineer. “This new role means I can act more as a leader and mentor to my team, both with technical issues and personal motivation. I try to bring energy and positivity to my team,” says Red.